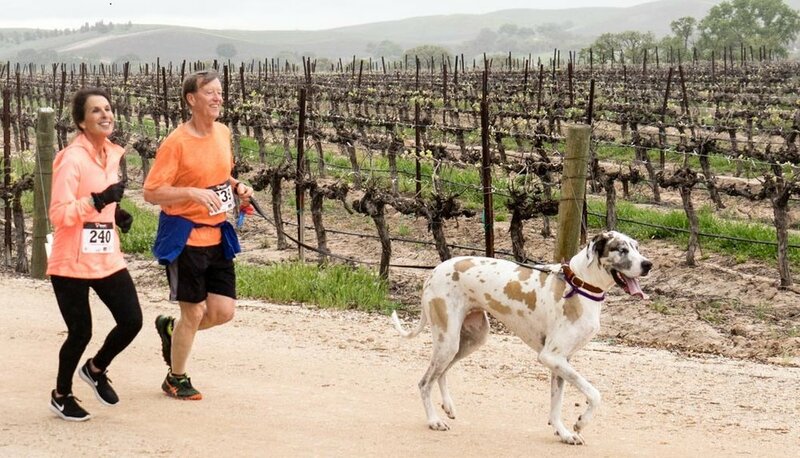 Dogs and their families are invited to join Sherwood Dog Park volunteers on a 2k or 4k jog or walk through the lush Vina Robles Vineyard at the 11th Annual Dog Jog on Saturday, May 4, 2019 at 10 am. After the jog, listen to live music as you enjoy lunch, wine tasting and tour the event expo comprised of local, dog loving vendors, and silent auction items. An early registration fee of $30 per dog and includes the 2k or 4k walk, jog, or run, commemorative dog bandana, goody bag, finisher’s medal, a voucher for a Cinqo de Mayo themed lunch, and a glass of Vina Robles wine and event glass for 21 and older participants. Vina Robles will be providing both lunch and wine. Additional vouchers for lunch ($12) or wine ($6) will be available for purchase at the event. Register your dog now to participate in this annual event. Walkers or runners without dogs are welcome. Early registration is open now until May 3, when the registration fee will increase to $35 on event day. Check-in and morning of registration begins at 9am on Saturday, May 4. The jog begins at 10 am. Click here to register by mail with a check. For more information, email info@sherwooddogpark.org or call 805.239.9326. The event will take place rain or shine. Participation in this fundraiser is a great way to “actively” help support the ongoing maintenance and improvements for the Sherwood Dog Park located in Paso Robles. Click here for Sponsor and Vendor opportunities for this event.